The K5's presence also angered the local community, who took to social media to complain. Reports claimed that a group doused its sensors with barbecue sauce, knocked it over and veiled it with a tarp. One Twitter user claimed they saw feces smeared on its shell, while another described the robot's use as "shameful". "The money that was spent on these robots could have gone towards homeless shelters," said another tweet. The shelter said it released the robot, nicknamed K9, to patrol the pavements around its centre in the Mission District, which had become a camp for the city's homeless population. "We weren't able to use the sidewalks at all when there's needles and tents, and bikes, so from a walking standpoint I find the robot much easier to navigate than an encampment," the SPCA's president Jennifer Scarlett told the Business Times. Responding to Dezeen, the shelter said that it only hoped to improve the safety of its employees, following an influx of crime in the surrounding area, and that it is "extremely sensitive" to the issue of homelessness. "In the last year we've experienced a great deal of car break-ins, theft, and vandalism that has made us concerned about the security and safety of the people on our campus," the SPCA's media relations manager Krista Maloney told Dezeen. "The security robot that we've been using on a pilot basis has been very effective at deterring these criminal incidents. The device helps us prevent crime; it doesn't attempt to remove homeless people from the sidewalk." The K5 is equipped with four cameras that monitor its surroundings, and moves on wheels at speeds of up to three miles per hour. It measures 1.5 metres tall and nearly one metre wide at its base, creating a sizeable obstacle on the pavement. San Francisco is tightening restrictions on autonomous machines on the streets – particularly delivery robots – with growing concerns over public safety. 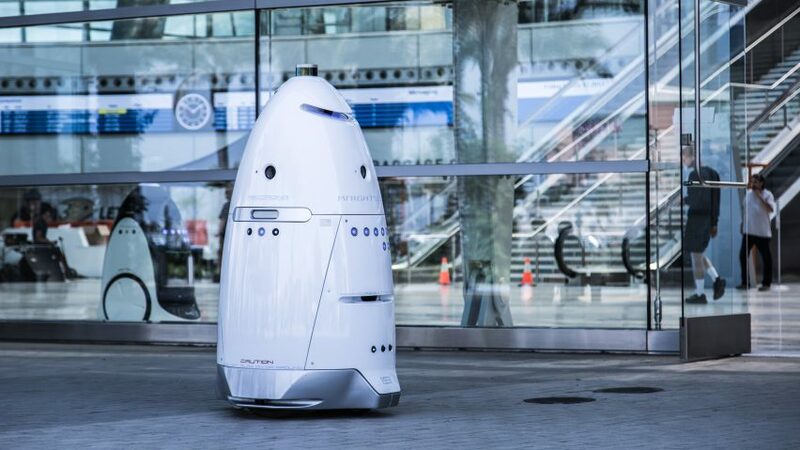 Knightscope's K5 model has already been embroiled in other controversies elsewhere, including knocking a toddler over in Silicon Valley, and falling into a pond in Washington DC after missing a set of stairs.